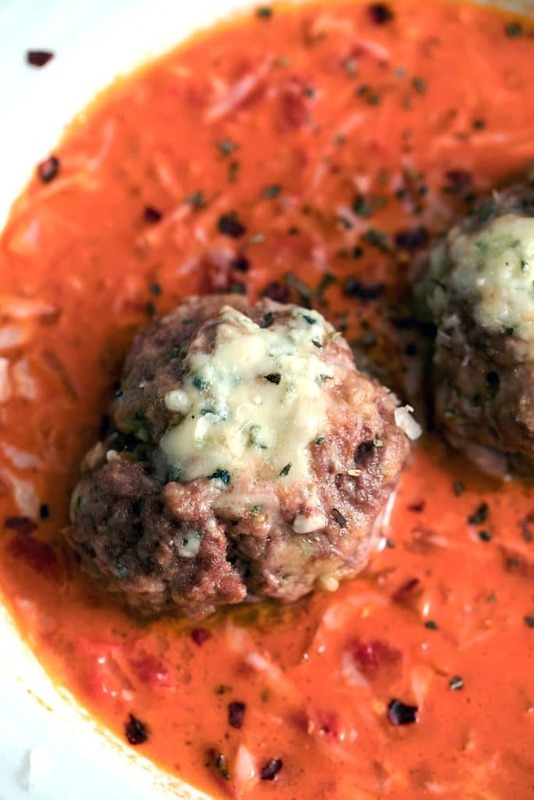 Gorgonzola meatballs may just be the most perfect meatballs in the world. Served over a creamy tomato gravy, the only thing missing is a side salad or a loaf of garlic bread! When it comes to cheeses, I love them all. But I’m an especially big fan of gorgonzola cheese and highly doubt I’ll ever get sick of it. I also enjoy meatballs quite a bit and love that there are so many different ways to prepare them. I don’t generally cook a whole lot from Rachael Ray (though her magazine is quite fun), but when I saw a recipe for Gorgonzola-Filled Meatballs with Creamy Tomato Gravy, I was filled with all kinds of inspiration. And I knew I had to make the dish. I altered the recipe quite a bit, so below you’ll see mine. Now, I’m sitting here in Bruegger’s Bagels desperately wishing they served gorgonzola meatballs because a bagel just isn’t going to cut it for me. Wait, what about gorgonzola meatballs on a bagel? Like a meatball sub on a bagel? OMG yes please, can we make this happen ASAP? I made a few changes to the original meatball recipe, including using all ground beef instead of veal and significantly cutting down on the amount of gorgonzola cheese used. Not because I wanted them to be healthier or because I don’t like gorgonzola; I just felt like an entire ounce of cheese in each meatball was kind of a lot, especially given that gorgonzola is so strong. If you want to add more cheese, go for it! You should know by now that I never judge. This makes for a really simple meal; gorgonzola meatballs over a creamy tomato sauce. You could definitely serve these with pasta (or as the original recipe suggests, potatoes… which I think is semi-odd), but I was honestly perfectly happy with just a couple meatballs in the sauce. I do recommend having a nice green vegetable on the side; sautéed spinach would be perfect. Then again, I wouldn’t turn down garlic bread either. These were simply amazing. I could have eaten all 8 at once, but instead they made for some really fabulous leftovers. Lunch, dinner, and if my dad were here he would have eaten them for breakfast (he eats EVERYTHING for breakfast!). I will definitely be making these again and also feel like they’d be an awesome party food. I’d probably make them a little smaller for a party, but for personal consumption (?!) they were the perfect size. Come to think of it, you can really fill the meatballs with absolutely anything depending on what your dining companions or party guests would like. But you really can’t go wrong with gorgonzola cheese. Trust me on this one. What’s your dream meatball? (and no, you shouldn’t feel any shame for dreaming about meatballs!). Place meat in a mixing bowl and season with 1/4 tsp salt and 1/4 tsp pepper. Add in garlic, egg and additional egg yolk, parmesan, bread crumbs, and minced sage. 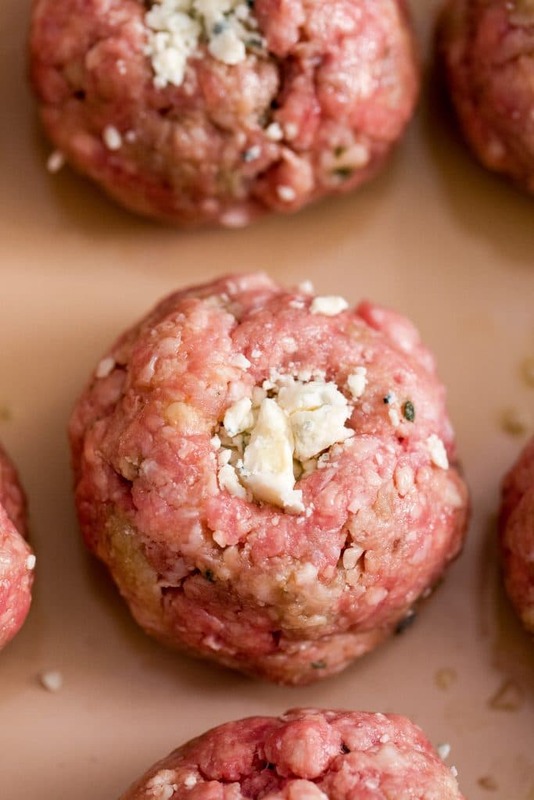 Roll into 8 large meatballs and arrange in a large baking dish. Coat the meatballs with 2 Tbsp extra-virgin olive oil. Use a wooden spoon to make an indentation halfway into the meatball and fill the cavity with gorgonzola cheese. Bake meatballs for 15-20 minutes, until they’re golden brown and cooked through. While meatballs are cooking, make the tomato sauce. Heat remaining 1 Tbsp extra-virgin olive oil and butter in medium saucepan over medium heat and add bay leave and onion. Season with remaining 1/4 tsp salt and 1/4 tsp pepper. Add chicken stock and tomatoes and heat through. Stir in the cream, reduce heat to medium-low, and simmer for about 10 minutes to thicken slightly. Spoon sauce into shallow bowls and top with meatballs. Sprinkle with additional parmesan cheese. 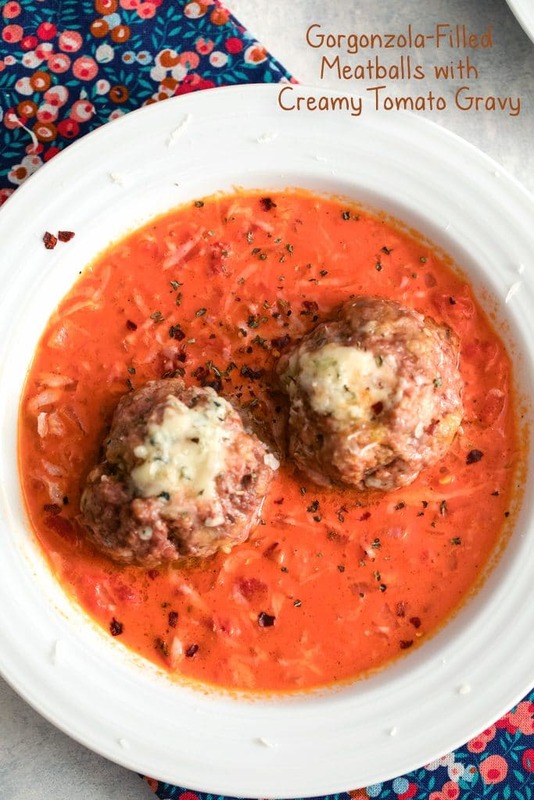 26 Responses to "Gorgonzola Meatballs with Creamy Tomato Gravy"
oooh this looks delicious, definitely adding this to my ever growing list of recipes to try. Holy yum! These looks amazing! Gorgonzola is one of my favorites!! holy cow, i totally want one of those 🙂 they look fabulous! Aww, the power of cheese. 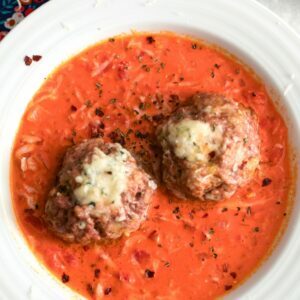 I love cheese and these meatballs look delicious! I’m researching meals right now for a dinner I’m making on Saturday night- this looks PERFECT!!!! Looks delicious! 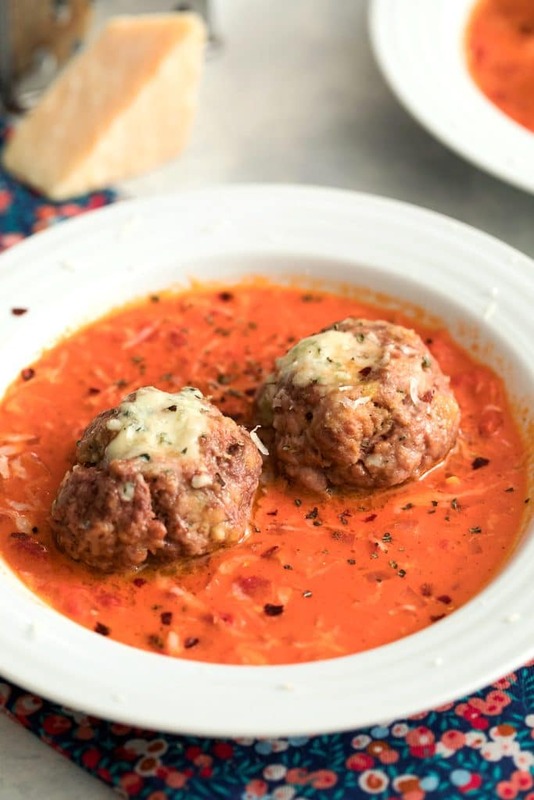 What a great idea…stuffed meatballs. I love gorgonzola! Cute blog you two! 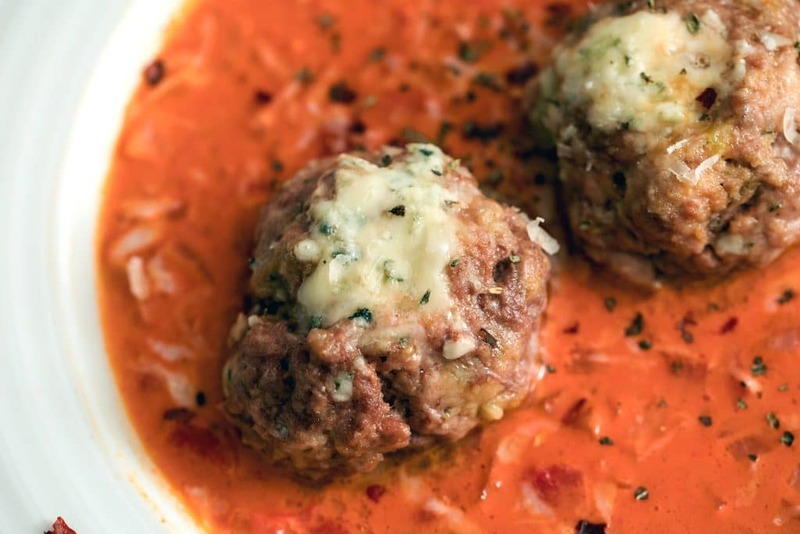 We also are big cheese lovers – makes these meatballs look really tasty! I’m lucky because I get to try most of Sues’s delicious dishes.. This one is one my personal favorites. The recipe makes plenty so I was able to keep fed at work for several days! whoa, delish! mmm mmm mmm. Such a good party food. I want to try this the next time I am invited somewhere. You’re doing a mighty fine job selling those GarlicZooms. My work team did a massive cooking class together last night and my teammate Ashley bought one explicitly because she saw it here. I’m still using a press so consider me in the market as well. Definitely perfect party food! My mouth is watering just looking at the pictures! I love meatballs and these have all of my favorite ingredients. They look and sound great. 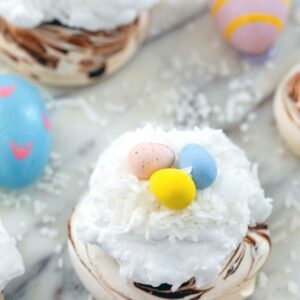 I made these today…wonderfully delicious and easy! 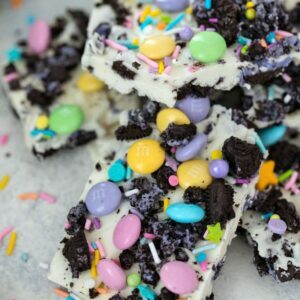 Made these over the weekend, they were AMAZING! Served them with Barilla picolini pasta and an argula salad tossed in lemon juice/evoo vinagrette. DIVINE! Made these last night and oh my holy GOD how delicious. we have made this 20 times varying cheese amounts and adding this or that, its amazingly good, im a meat and taters guy, 110%, but i eat this when she makes it. @Randy S. Thank you so much!! I’m literally right in the process of updating the photos on this post and this makes me so happy to hear! 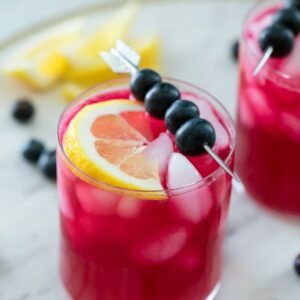 Such great flavors in this recipe! Yum! Yum! Perfect comfort dish for cold winter nights! 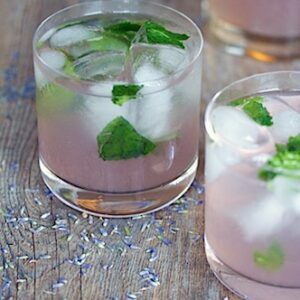 You had me at sage leaves. This recipe sounds fantastic! I can’t wait to try it.